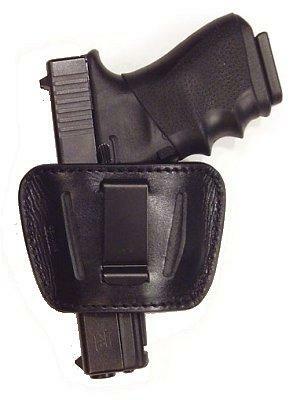 This leather holster has belt slots to fit up to 1.75" belt, with a removeable clip for wearing inside or outside waistband, right or left hand and can be worn in the small of the back. O35 Fits medium to large frame auto handguns such as 9mm and .45 ACP handguns, including 1911. O36 Fits small to medium frame auto handguns such as .22, .25, .32, and .380 hand guns, plus some smaller 9mm models. Size Fits Belt Width to 1.75"
Belt Size Up To 1.75"